Our 10th Annual Fundraiser is has outgrown the beach this year. 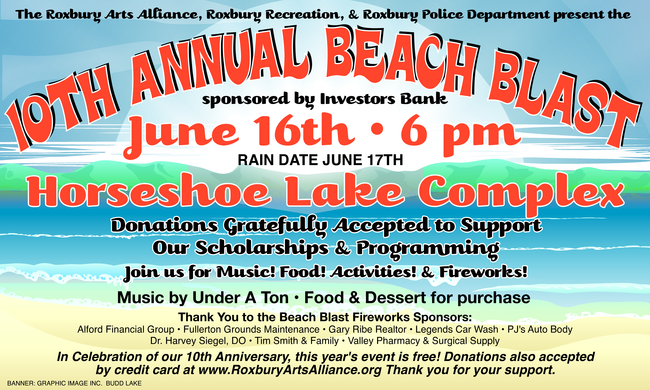 Thanks to the free family activities that are brought to us by Roxbury PD, we are moving over to the back of Horseshoe Lake by the bandshell and pavilion. Music will be provided by Under a Ton and we will have food available for purchase and coming back due to popular demand is the Funnel Cake by Fire Company #1. In addition to the food, music and fireworks, there will be some carnival games, bouncy house, home security info, police dog demo, fire trucks, and so much more for your families enjoyment. Although this is a free event, donations will be gratefully appreciated since this event funds our annual scholarships and some programming. You can even donate online, now or that night at the event. Looking forward to seeing you at the non-beach, Beach Blast.